I’ve been studying up on the Book of Abraham a bit lately, and as fascinating as all the scholarly, arcane parallels are, it’s even more exciting to see that some of Joseph Smith’s explanations of these symbols are easy to confirm in accessible pop culture. While critics have often had to come up with convoluted theories as to how Joseph got so many plausible details into the Book of Mormon, his equally startling “guesses” in the Book of Abraham are usually ignored…maybe because they are even more shocking. How could Joseph have known what any of these old Egyptian hieroglyphics meant? He didn’t know ancient Egyptian–hardly anybody in the world did! The Rosetta Stone itself had barely been translated around the time that Joseph first started producing the Book of Abraham. And yet, what should have been wild shots in the dark hold up remarkably well nearly two centuries later, when the basics of Egyptian are so widely available, that a major hotel here in Las Vegas, the Luxor, makes them into a cute and easily recognizable theme. In Facsimile 1, there’s a weird creature shown near the bottom. The text defines it as “the idolatrous god of Pharaoh.” Look closely–it’s a crocodile in the waters of the Nile. 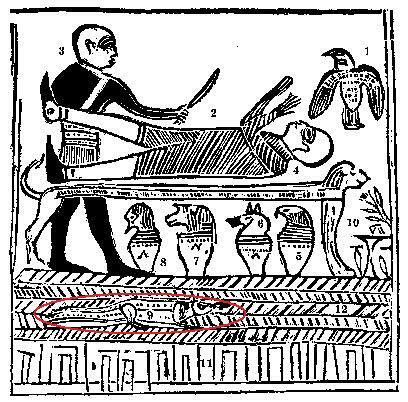 So, did the Egyptians of Abraham’s time really identify Pharoah with a crocodile-god? This post is not meant to explain the many astronomical references in the Book of Abraham. I’m not a scientist; I’m an English teacher. My interest is in analyzing why those astronomical references are there: what function do they serve? After studying them, I find that they consistently testify of the doctrines of Christ. The Pearl of Great Price itself is a fascinating text, and ironic. By far the smallest of the standard works, this tiny anthology is not a series of testimonies, a record of covenants, or a detailed collection of exegesis and exhortations, like most other scriptural works are. No, The Pearl of Great Price is far too ambitious for that. Just about the only thing it does is reveal the most important saving truths of eternity, connecting us directly to the Lord. Consider that the Bible Dictionary identifies seven major dispensations throughout world history: those begun by Adam, Enoch, Noah, Abraham, Moses, Jesus Christ, and Joseph Smith. Now glance through The Pearl of Great Price and notice whose records it amplifies: in order–Moses, Adam, Enoch, Noah, Abraham, Jesus Christ, and Joseph Smith. Consider that in the Doctrines of the Gospel manual for church classes, the Pearl of Great Price, which comprises less than 2½% of the standard works (61 out of 2475 pages), represents about 10% of the scriptures cited in the index (nearly a whole page out of nine and a half printed pages), an impressively disproportionate total. If The Pearl of Great Price were a basketball player, it’d be one foot tall and five times better than Michael Jordan. I labor this point because it relates directly to the use of astronomical information in The Pearl of Great Price’s Book of Abraham. These often confusing ideas about space and time are not a primer for astronomy as much as they are meant to add to our understanding of those massive spiritual truths with which this volume was designed to enlighten us.